The large amount of rain East Lansing has experienced over the past three weeks has deeply affected the construction and archaeology on campus. This delay in work has allowed us at the Campus Archaeology Program to turn our attention to the other side of archaeology: finds and analysis. Back here at our homebase in MSU’s Consortium for Archaeological Research, we’re working on analysis and interpretation of our artifacts and integrating this with our maps. 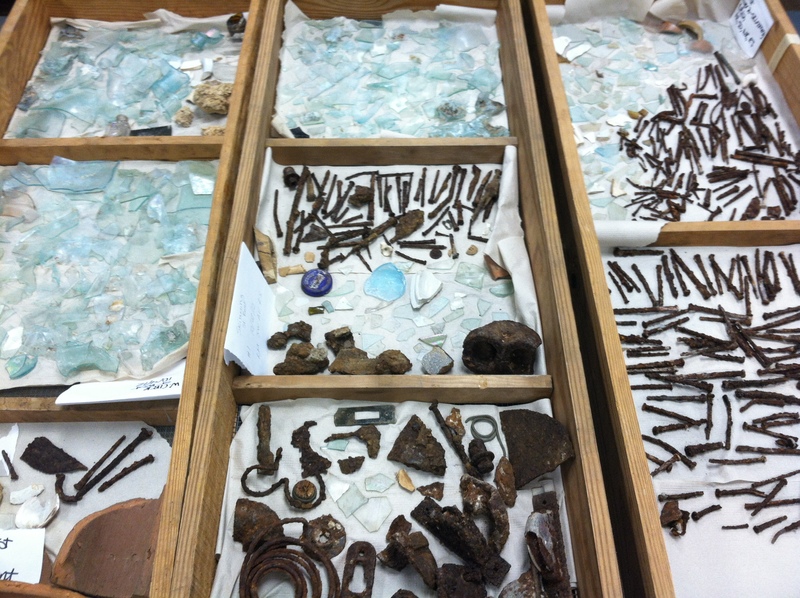 Artifacts found on this campus vary from types of ceramics and metal fixtures found within homes to industrial pipes and building materials. After the dig, the collected finds are returned to the lab and processed. This means that all of the finds are washed and dried. Following this process, members of our team work to identify the artifacts and input them into a database. Our team notes the type of artifact and the presence of identifying characteristics such as decorative styles, any wording or maker’s mark (trademark stamps), and/or if the piece is a specific part of a vessel such as rim, handle, or base. This allows us to look at just what types of things were being used in the early days at Michigan State College. In the meantime, another type of analysis is occurring upstairs in the archaeology computer lab. It is here where a slightly more technologically literate group (with skills I personally envy) works on the digital side of Campus Archaeology. Using Geographic Information Systems (GIS) members input the location of our digs on to real satellite images of the area. This creates a multilayered map with extensive information on the site. At current, these maps show the location of all our shovel tests (ST) (a surveying technique where a small pit is dug to sample the area). Each shovel test is associated with the archaeological project site it is within, who dug it, and a positive or negative indication of whether finds were collected. This process helps us located the areas of early activity on Michigan State’s campus. So far these two important processes have been separated. While the rain has kept us off site and stuck indoors, we have been inspired to initiate an integration of the two forms of analysis into one helpful mapping system. Our goal is to create a more robust and useful purpose for the Campus Archaeology Program’s GIS maps. The result of this will be the creation of a way to integrate the catalogue of artifacts into the map. In order to represent the artifacts in the GIS system our team needed to come up with a list of artifact types that not only fully incorporates the variety and cultural relevance, but also is not overwhelming to the system. This took a rather tedious meeting and lots of debate in order to develop the shortest and most complete list. We debated whether we should focus on broad types such as pottery or metal, or more specific types like whiteware, stoneware or pearlware. A second debate was whether we should assess them by presence or absence, a technique that works well if something is broken within the pit, or by the frequency of finds, which works well with lots of little artifacts. We also debated how to classify artifacts, like whether we should separate items by function or material used, which becomes problematic with items like buttons that are all different materials but same function. We came up with a semi-finalized list of around 25 artifact types will be inputted in to the GIS system. From here, each ST will be associated with either a presence/absence or item amount for each of the 25 types. Once this is done we will be able to use the GIS maps to show where artifacts were collected, and further look at the location and concentrations of artifacts by statistical analyses. This process, which is one of the most intensive off site projects, will with all hopes be fruitful to the knowledge of your Campus Archaeology Team. I have an old oil painting that appears to be very old. Where could I get it carbon dated or have it evaluated? Its size is 3 ft. wide and 5 ft. tall and is a painting of the crucafixtion. That’s outside our area of expertise. I would suggest contacting an art appraisal service.